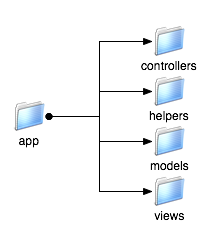 The model-view-controller (MVC) architecture that we first encountered in Chapter 1, Introducing Ruby on Rails is not unique to Rails. In fact, it pre-dates both Rails and the Ruby language by many years. However, Rails really takes the idea of separating an application’s data, user interface, and control logic to a whole new level. The controller renders the page and sends it to the view. 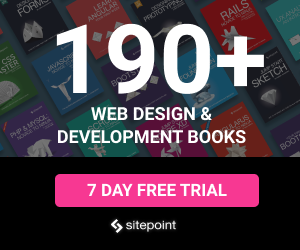 The view sends the page back to the client for the browser to display. This process is illustrated in Figure 4.3. It improves scalability (the ability for an application to grow): if your application begins experiencing performance issues because database access is slow, for example, you can upgrade the hardware running the database without other components being affected. It makes maintenance easier: because the components have a low dependency on each other, making changes to one (to fix bugs or change functionality) does not affect another. It promotes reuse: a model may be reused by multiple views, and vice versa. It makes the application distributable: a distinct separation of code between components means that each of them could potentially reside on a separate machine, if necessary. If you haven’t quite got your head around the concept of MVC yet, don’t worry. For now, the important thing is to remember that your Rails application is separated into three distinct components. Jump back to Figure 4.3 if you need to refer to it later on. Rails implements the concept that models, views, and controllers should be kept quite separate by storing the code for each of these elements as separate files, in separate directories. This is where the Rails directory structure that we created back in Chapter 2, Getting Started comes into play. The time has come for us to poke around a bit within that structure. If you take a look inside the app directory, which is depicted in Figure 4.4, you’ll see some folders whose names might be starting to sound familiar. ActionController – ActionController is the component that handles browser requests and facilitates communication between the model and the view. Your controllers will inherit from this class. It forms part of the ActionPack library, a collection of Rails components that we’ll explore in depth in Chapter 5, Models, Views, and Controllers. ActionView – ActionView is the component that handles the presentation of pages returned to the client. Views inherit from this class, which is also part of the ActionPack library. It also has a few other neat tricks up its sleeve. Let’s look at some of them now. ActiveRecord ships with a large number of database adapters to connect to a variety of popular database server packages, such as MySQL, PostgreSQL, Oracle, and Microsoft SQL Server. The ActiveRecord module is based on the concept of database abstraction. As we mentioned in Chapter 1, Introducing Ruby on Rails, database abstraction is a way of coding an application so that it isn’t dependent upon any one database. Code that’s specific to a particular database server is hidden safely in ActiveRecord, and invoked as needed. The result is that a Rails application is not bound to any specific database server software. Should you need to change the underlying database server at a later time, no changes to your application code should be required.